The Natural Mystic Tours has got two guides, an Italian and Brazilian ones. They are highly qualified and will guide you in different routes. 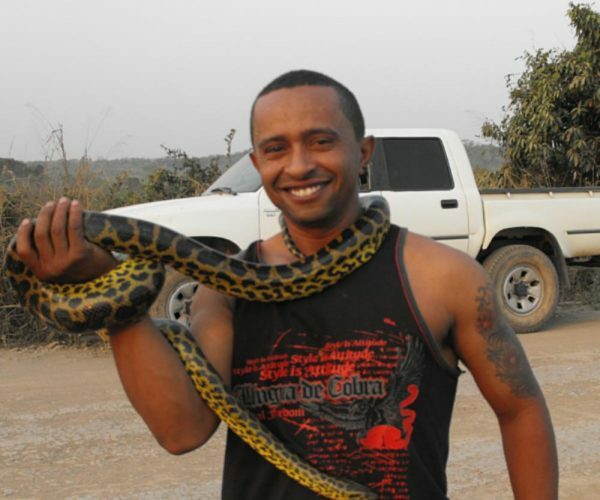 A couple of lines about Edson: he has been working as a tourist guide in Pantanal since 1992 and, as he was born in Poconé, he knows a lot about this area. He is specialized in the ecological-environmental area, conservation of water resources and recognition and use of officinal plants. Throughout his long career he has received several appreciations, including his appearance on national television as a guide of Pantanal, and on an English daily newspaper which introduced the wonders of the Brazilian Pantanal. A couple of lines about Mirko: he has been a tour operator for ten years and he can speak English, Spanish and French (beyond Italian and Portuguese). Passionately fond of everything concerning nature, after various South American and Brazilian adventures especially, he decided to go to live in the most relevant naturalistic places of South America in order to give everyone the opportunity to fully experience and enjoy the heavenly Pantanal.